So, now that I’ve gotten (most) of my thoughts about fall through rose colored glasses out, time for the good stuff! Making applesauce. 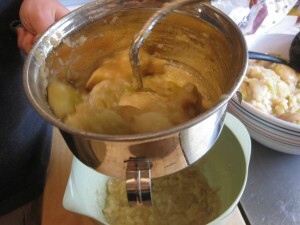 I will say that I was shocked to find out exactly how easy it is to make applesauce from scratch. It always seemed mystical growing up when Aunt D would make it, especially with its pink hue. And now, even though I make it myself and know exactly what it entails, I will say it’s still pretty magical. 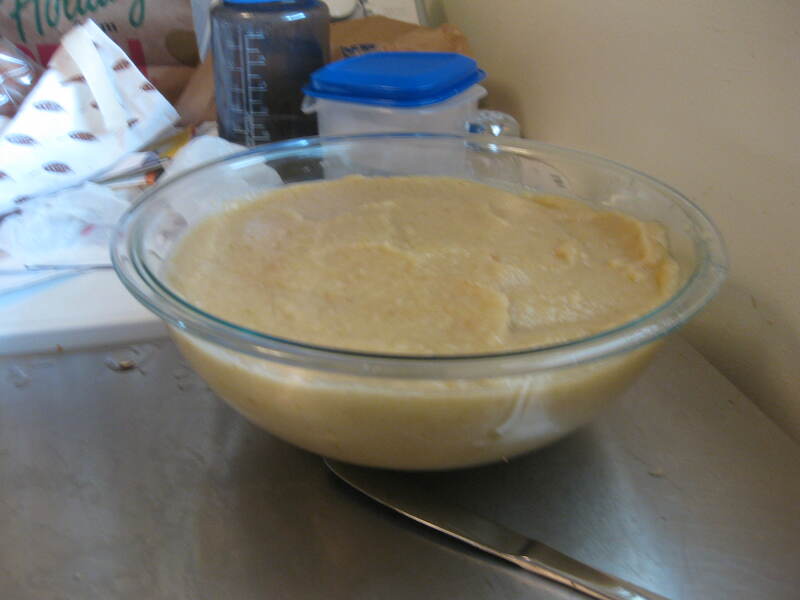 There’s nothing quite like some warm applesauce with just a touch of vanilla ice cream. First things first. 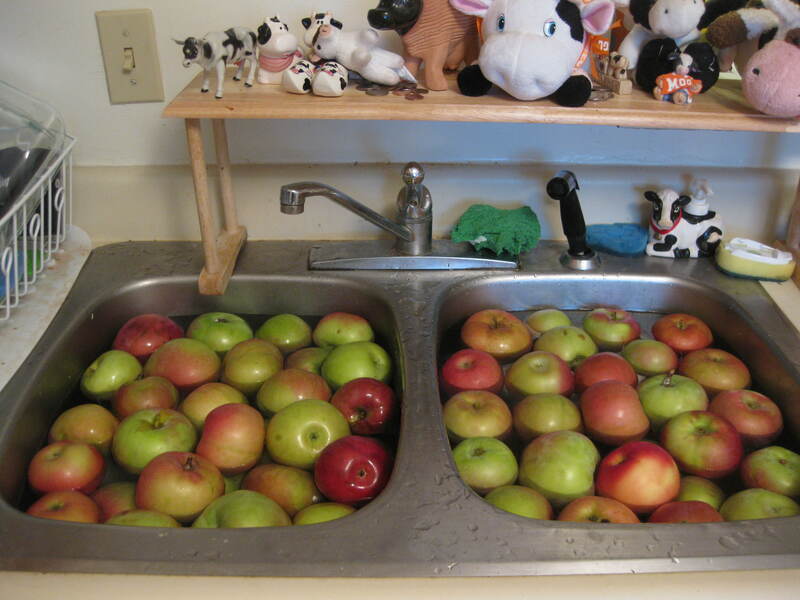 All of the bajillion apples you have need to be washed. This presents a bit of an issue for us in our kitchen, because we’re not exactly teeming with space. Because the orchard that we picked from must have sprayed heavily before picking (and no rain in weeks to wash any of it away), they definitely required a good scrubbing. When I was doing those, I came up with a good system and reused it for the Macs in this batch. It’s a bit like bobbing for apples, but what I did was fill up both sides with cold water. In one side I included a bit of vinegar and put half the apples in, and weighted them down with a cutting board so they were fully submerged. After a bit I scrubbed each one individually and moved them to the side with just plain water to soak for a bit. The other half went in the vinegar soak and got switched to the plain water when the others were done. 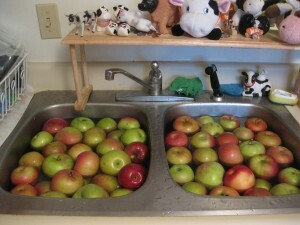 Next Chris and I got to work quartering and coring all of the apples. No need to peel them, as long as you have a food mill or some other contraption that will catch the skins after cooking. 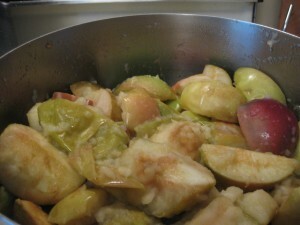 Plus, if you’re lucky, the red skin will tint the applesauce pink–my favorite part! As we quartered them, we put them in our biggest stock pot (the bigger the better) up to the top. We actually had to do two rounds of this whole process, since our stock pock isn’t big enough for a half-bushel’s worth! Then, and this is where it gets a little tricky. 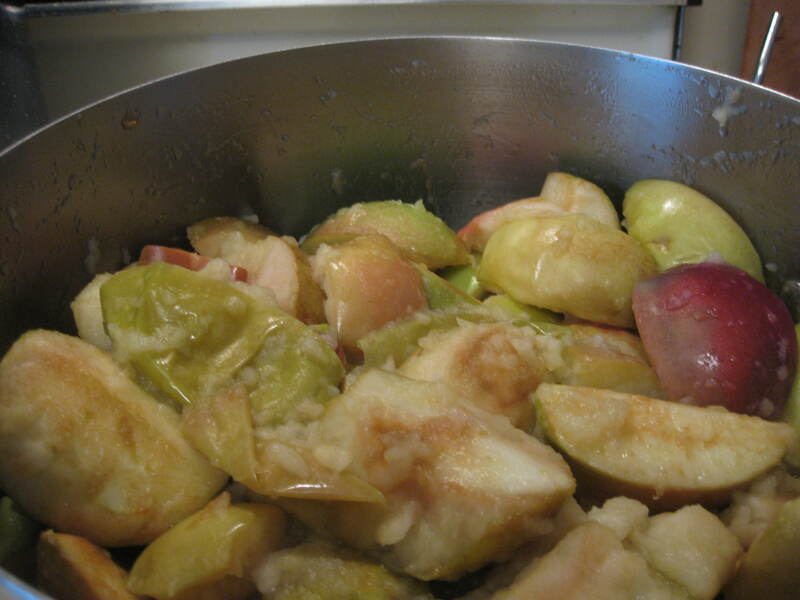 We needed to add a bit of water, cover them, and cook the apples on medium (or lower if our stove is running hot). How much water? That really depends on how juicy the apples are to begin with. We usually start with a shy quarter of a cup and go from there. 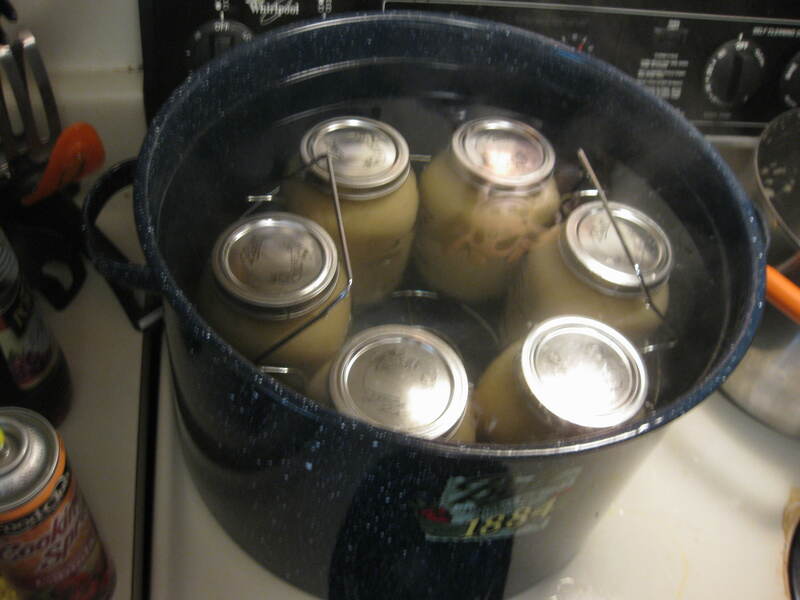 Mainly, we wanted to keep them moist enough so that the ones in direct contact with the pot didn’t scorch. These were very juicy, so we didn’t need much water at all. We stirred frequently, trying to again keep them from scorching at the bottom, but also to redistribute so that they cooked fairly evenly. You’ll see from the picture above that they’re already cooked down a lot from what we started with, and it cooked down even more. Also, some of the apples were ready to be applesauce, where others have hardly cooked at all. Keep on stirring! Essentially what we were looking for is for all of the apples to be able to be easily mushed with a wooden spoon. We used a Foley food mill to get the sauce consistency. Essentially it’s just a hand crank that pushes the apple flesh through a sieve and leaves behind the skin. Though you can push firmer ones through, it takes a lot more time and effort. And Chris was already putting in a lot of effort to get all these mushed through. 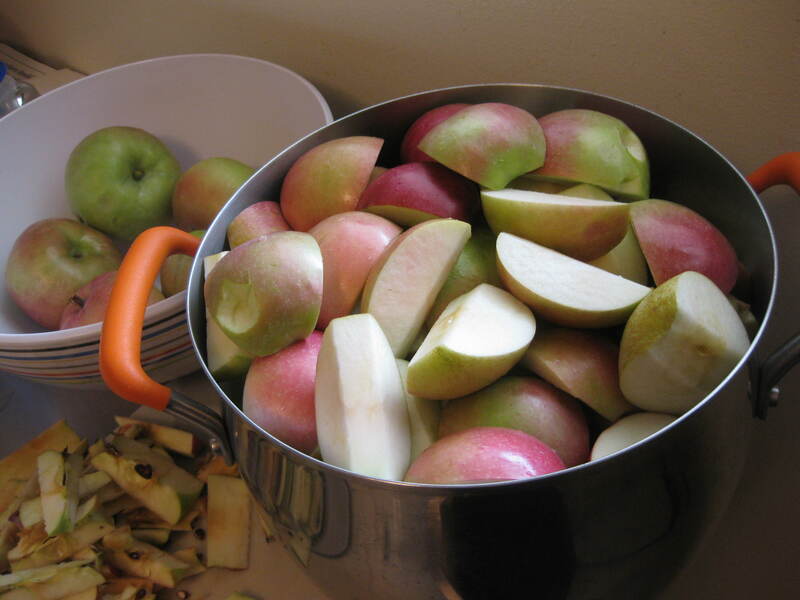 Once Chris had run all of the apples through the food mill, we needed to can them in our warm quart jars that were waiting. We actually filled this bowl a few times during the process, but I was putting them in jars as we went so we could be sure the sauce was still warm when it went into the jars. The pictures for the rest of the process are quite lacking, so I’ll apologize in advance. The first batch we had done involved a cracked jar, and I suspect it was because we didn’t quite move fast enough and the jars got too cold before they went into the too hot canner. We managed to salvage most of the sauce, but I certainly didn’t want a repeat. 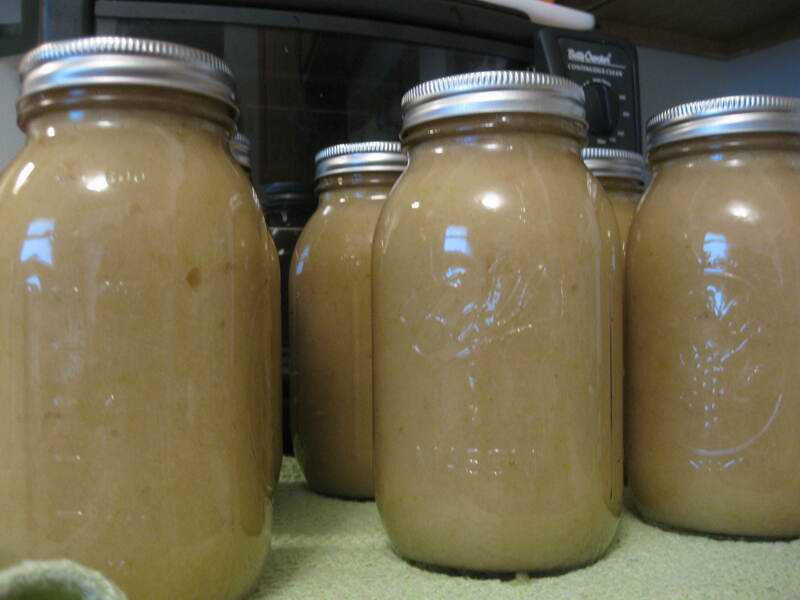 Applesauce is a precious commodity! These are the jars, newly filled and ready to be processed for 20 minutes. Processing is a fancy way of saying rapidly boiling in a whole lot of water (covered). After processing, we put them on a towel and left them undisturbed for the whole night. We didn’t hear the satisfying pop of the jars sealing because we went to bed, but they all sealed correctly. Now we’ll have yummy applesauce for snacks all year long (or however long it actually lasts Chris…). The only thing I will say that was disappointing about this batch is that it didn’t turn the rosy pink hue it usually does. That was always my favorite part of Aunt D’s applesauce. The good news is that it tastes the same, and the color? Well, I’ll just have to keep on my rose-colored glasses. I’m glad I see Ball Mason jars. They are superior to Kerr, btw..